In this article, I’m going to talk about a very private situation. Sorry, I couldn’t help myself. One of the least talked about topics in Combat Sports is groin protection. Normally referred to as a cup. You won’t be allowed to fight in any sanctioned competition without a mouthpiece, and protective cup. There are several types of cups. From metal Muay Thai cups to MMA compression cups. 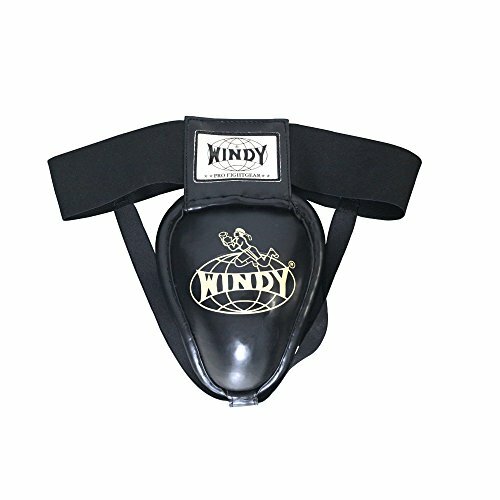 Boxing only allows one type of groin protection to be used. So, if you’re a boxer, this article may not benefit you much, unless you plan on venturing into other Combat Sports. Traditional Muay Thai cups offer the best protection, but they’re the most primitive design, as well as the most difficult, and time-consuming to wear. If you’re anything like me, then your private parts are very valuable to you. I will ask you a simple question: which would you rather protect your valuables with? Plastic or metal? My go to cup of choice is the Windy Steel Groin Guard (WSGG). The WSGG is as easy to put on as a pair of underwear, and it delivers more protection than any other cup on the market aside from a traditional Muay Thai cup. It kills two birds with one stone. It saves you the same amount of time as compression shorts cup would, while also providing the protection that only metal can. There isn’t much to the WSGG. The metal portion is sewn to the waistband, at the top and bottom of the cup. It’s incredibly simple in design, and it needs to be, because it’s not the kind of gear that’s built to be seen. It is the kind of gear that is only meant to do a single job, and it does it very well. If it was any prettier than it was; let’s say in came in gold. Then it would be absolutely pointless, because no one is interested in the color of another competitor’s cup. I’ve used regular Sports Jockstraps before. They weren’t flexible enough for kickboxing purposes, in my opinion. I’ve even used other plastic cups made specifically for Combat Sports of all kinds. And they all cracked on me. Most of the time it only happened during sparring. But one time it even happened to me during a fight, and the fight had to be stopped. It was quite the traumatic experience. They use Metal Alloys to protect precious metals, such as gold in Fort Knox. Why would you want anything less than metal to protect your family jewels? Unfortunately, I get kicked in the private area far too often. If it wasn’t for this cup, I may not have been able to have kids. I know I’m not the only individual that feels like they get kicked in the groin far more often than normal. Even if I did other sports, I would still wear this cup. The waistband itself is also extremely durable. I have above-average flexibility as a kickboxer, and I can throw some pretty flashy and extraneous kicks. I’ve also gone up and down in weight significantly since owning this cup. The heaviest I’ve ever weighed myself on the scale was 186 lbs. That was 5 days before the weigh-ins of a title fight, which I had to weigh 170 lbs for. I’m going to assume that I lost 10 lbs or so when I was getting in shape for this specific fight. Before cutting down to 171 lbs, to make the specific weight limit, I also fought as low as at 147 lbs. Through all of those training camps, I have worn the exact same cup. There is also a Velcro connection in the rear side of the waistband, in case you need to adjust for fitting. However, I’ve never had to adjust it since the first time I wore it. This may sound gross but I’ve had this cup since 2012. That’s almost 6 years at the time of this writing. It’s not the most lucrative expense that I’ve ever had to make, of course. But I honestly can’t think of anything else that I’ve ever bought in my life, that brought me as much utility as this cup. I’ve used and abused this cup for 6 years, and I wouldn’t be surprised if I got another 6 years out of it. In fact, if I ever end up headlining a pay-per-view card in my future, I hope I’m wearing the same exact cup. The Windy Steel Groin Guard is the physical manifestation of Life Insurance. It would be an understatement to call it a purchase, or even an investment. It's a piece of equipment that's almost as important to Combat Sports as the actual exercises themselves. If there's anything in life that I will give a perfect score to, it would be the Windy Metal Cup. At this point in time, I honestly can't imagine a cup being better than this. Windy Muay Thai Steel Cup review was written by Brima Kamara, after several months and rounds of training. It was not sponsored or otherwise endorsed by advertisers. Greetings, my name is Brima Kamara. I am a recently turned professional fighter in Kickboxing & MMA. As an amateur I was considered pound for pound the best in the world in Kickboxing. I also have a passion for many other things such as video games, comic books and writing.